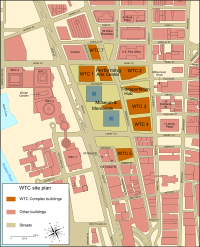 The World Trade Center site, formerly referred to as "Ground Zero" or "the Pile" immediately after the September 11 attacks, is a 14.6-acre (5.9 ha) area in Lower Manhattan in New York City. The site is bounded by Vesey Street to the north, the West Side Highway to the west, Liberty Street to the south, and Church Street to the east. The Port Authority owns the site's land (except for 7 World Trade Center). The previous World Trade Center complex stood on the site until it was destroyed in the September 11 attacks. The Port Authority of New York and New Jersey (PANYNJ), Silverstein Properties, and the Lower Manhattan Development Corporation (LMDC) have overseen the reconstruction of the site as part of the new World Trade Center, following a master plan by Studio Daniel Libeskind. Developer Larry Silverstein holds the lease to retail and office space in four of the site's buildings. The western portion of the World Trade Center site was originally under the Hudson River, with the shoreline in the vicinity of Greenwich Street. On this shoreline close to the intersection of Greenwich Street and the former Dey Street, Dutch explorer Adriaen Block's ship, the Tyger, burned to the waterline in November 1613, stranding Block and his crew and forcing them to overwinter on the island. The remains of the ship were buried under landfill when the shoreline was extended starting in 1797, and were discovered during excavation work in 1916. The remains of another ship from the eighteenth century were found in 2010 during excavation work at the site. The ship, believed to be a Hudson River sloop, was found just south of where the Twin Towers used to stand, about 20 feet below the surface. The original World Trade Center complex. 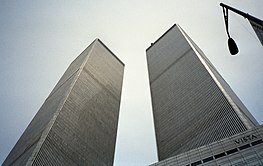 At the time of their completion the "Twin Towers"—the original 1 World Trade Center (the North Tower), at 1,368 ft (417 metres), and 2 World Trade Center (the South Tower)—were the tallest buildings in the world. The other buildings in the complex included the Marriott World Trade Center (3 WTC), 4 WTC, 5 WTC, 6 WTC, and 7 WTC. All of these buildings were built between 1975 and 1985, with a construction cost of $400 million (equivalent to $2,500,000,000 in 2018 dollars). The complex was located in New York City's Financial District and contained 13,400,000 square feet (1,240,000 m2) of office space. 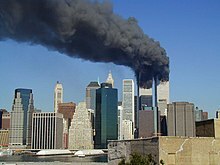 On the morning of September 11, 2001, Islamic terrorists affiliated with Al-Qaeda hijacked American Airlines Flight 11 and United Airlines Flight 175, both which were en route to Los Angeles, and intentionally crashed them into the two main towers of the World Trade Center. The towers collapsed within two hours of the collisions. 2,606 people, including 2,192 civilians, 343 firefighters, and 71 law enforcement officers who were in the towers and in the surrounding area died in the attacks, as well as 147 civilians and the 10 hijackers aboard the two airliners. After the collapse of the World Trade Center, hospital workers and law enforcement officers began referring to the World Trade Center site as "Ground Zero". 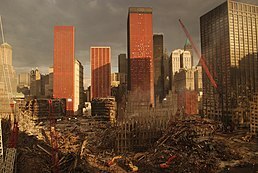 The collapse of the towers spread dust across New York City and left hundreds of thousands of tons of debris at the site. To organize the cleanup and search for survivors and for human remains, the New York City Fire Department divided the disaster site into four sectors, each headed by its own chief. Cleanup workers trucked most of the building materials and debris from Ground Zero to Fresh Kills Landfill in Staten Island. Some people, such as those affiliated with World Trade Center Families for Proper Burial, were worried that human remains might also have been inadvertently transported to the landfill. 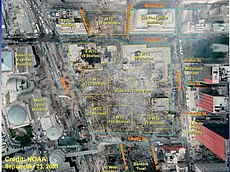 According to NIST, when WTC 1 (the North Tower) collapsed, falling debris struck 7 World Trade Center and ignited fires on multiple floors. The uncontrolled fires ultimately led to the progressive collapse of the structure. The World Trade Center site 17 days after the September 11, 2001 terrorist attacks. Buildings surrounding the site of the collapsed towers are fitted with mesh to prevent further damage and large construction vehicles are being used to clear debris. Shortly after the attacks, the surrounding buildings were fitted with red mesh to prevent further damage. In November 2001, the remaining portions of Building 4 were leveled. In December 2001, a temporary viewing platform at Fulton Street, between Church Street and Broadway, was opened to the public. That month, the last standing perimeter columns from the North Tower and the last remaining portions of Building 6 were removed. Early estimates suggested that debris removal would take a year, but cleanup ended in May 2002, under budget and without a single serious injury. The Winter Garden Atrium was reopened to the public on September 17, 2002, the first major structure to be completely restored following the attacks. Starting March 11, 2002, eighty-eight searchlights were installed and arranged to form two beams of light shooting straight up into the sky. This was called the Tribute in Light, and was originally lit every day at dusk until April 14, 2002. After that, the lights were lit on the two-year anniversary of the attack and have been lit on each subsequent September 11 since then. In February 2005, the New York City Medical Examiner's office ended its process of identifying human remains at the site. 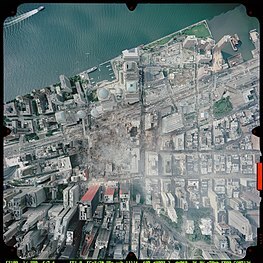 Portions of the South Tower had also damaged the nearby Deutsche Bank Building, which soon became filled with toxic dust. By 2002, Deutsche Bank determined that its building was unsalvageable and it was scheduled for demolition. In January 2011, the demolition of the Deutsche Bank Building was completed. In July 2010, a team of archaeologists at the site discovered the remains of a 32-foot (9.8 m)-long boat over 200 years old; it was probably made in the 18th century and dumped there along with wooden beams and trash in about 1810 to make up the land. The boat had been weighted to make it sink as part of foundations for a new pier. Samples of its wood have been taken for dendrochronology. While the PANYNJ is often identified as the owner of the WTC site, the ownership situation was complicated after the September 11 attacks. The Port Authority did own a "significant" internal portion of the site of 16 acres (6.5 ha) but has acknowledged "ambiguities over ownership of miscellaneous strips of property at the World Trade Center site" going back to the 1960s. It was unclear who owned 2.5 acres (1.0 ha) of the site which is land where streets had been before the World Trade Center was built. In subsequent deals, the Port Authority gave some land to Larry Silverstein, including the land under 2 and 3 WTC in 2008. Above: The World Trade Center site prior to the September 11 attacks. Above: Preliminary site plans for the World Trade Center rebuild. Soon after the September 11 attacks, Mayor Rudy Giuliani, Governor George Pataki, and President George W. Bush vowed to rebuild the World Trade Center site. On the day of the attacks, Giuliani proclaimed, "We will rebuild. We're going to come out of this stronger than before, politically stronger, economically stronger. The skyline will be made whole again." During a visit to the site on September 14, 2001, Bush spoke to a crowd of cleanup workers through a megaphone. An individual in the crowd shouted, "We can't hear you," to which Bush replied, "I can hear you. The rest of the world hears you. And the people who knocked these buildings down will hear all of us soon." In a later address before Congress, the president declared, "As a symbol of America's resolve, my administration will work with Congress, and these two leaders, to show the world that we will rebuild New York City." The immediate response from World Trade Center leaseholder Larry Silverstein was that "it would be the tragedy of tragedies not to rebuild this part of New York. It would give the terrorists the victory they seek." 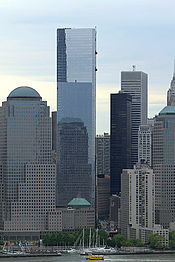 However, in 2011, only one building, 7 World Trade Center, had been rebuilt. As of June 2018, the buildings that have been rebuilt so far include 7 World Trade Center, One World Trade Center, 4 World Trade Center, and 3 World Trade Center. 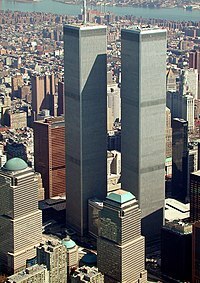 The original twin towers took less than three years from start of construction to be finished and five years from the beginning planning stages. However, given the complexity and highly political nature of the rebuilding efforts, they are often cited as an example of a successful public-private collaboration and are taught as a case study in successful negotiations. Governor Pataki established the Lower Manhattan Development Corporation (LMDC) in November 2001, as an official commission to oversee the rebuilding process. The LMDC coordinates federal assistance in the rebuilding process, and works with the PANYNJ, Larry Silverstein, and Studio Daniel Libeskind, the master plan architect for the site's redesign. The corporation also handles communication with the local community, businesses, the city of New York, and relatives of victims of the September 11 attacks. A 16-member board of directors, half appointed by the governor and half by the mayor of New York, governs the LMDC. Meier Eisenman Gwathmey Holl (Peter Eisenman, Richard Meier, Charles Gwathmey and Steven Holl), known as "The New York Five"
An episode of CBS's 60 Minutes in 2010 focused on the lack of progress at Ground Zero, particularly on the lack of completion dates for a majority of the buildings, the main tower, One World Trade Center (previously known as the Freedom Tower)'s having undergone three different designs, and the delays and monetary expense involved. Investor Larry Silverstein said the Port Authority's estimated completion date for the entire site was 2037, and billions of dollars had already been spent on the project, even though Ground Zero "is still a hole in the ground". During an interview for the episode, Larry Silverstein said: "I am the most frustrated person in the world...I'm seventy-eight years of age; I want to see this thing done in my lifetime". However, it was noted that in early 2011, all five office towers of the World Trade Center had begun construction. One World Trade Center (previously coined the "Freedom Tower" by Governor Pataki) is the centerpiece of Libeskind's design. The building rises to 1,368 feet (417 m), the height of the original World Trade Center north tower, and its antenna rises to the symbolic height of 1,776 feet (541 m). This height refers to 1776, the year in which the United States Declaration of Independence was signed. The tower was a collaboration between Studio Daniel Libeskind and Skidmore, Owings & Merrill architect David Childs. Childs acted as the design architect and project manager for the tower, and Daniel Libeskind collaborated on the concept and schematic design. The design was finalized in 2004, but was revised extensively after the NYPD raised security concerns, which delayed the start of the construction by two years. In 2006, the Port Authority took over from Silverstein Properties. The project's developer Tishman Construction Corporation was the construction manager at the time. Construction began in April 2006. Digging the foundation and installing tower-foundation steel columns, concrete, and rebar took twice as long as it normally would due to the existence of the subway line under West Broadway nearby. The building reached grade level by 2010, progressed at a pace of one floor a week, topped out in August 2012, and was structurally completed in May 2013. The building opened on November 3, 2014, and the first 170 employees of anchor tenant Conde Nast began their work there. Danish architect Bjarke Ingels designed Two World Trade Center, also known as 200 Greenwich Street. The building's gardens integrate Tribeca with the Financial District at the World Trade Center. As part of a 2010 lease deal to finance 4 WTC, there were plans to build 2 and 3 World Trade Center to ground level. Construction of everything up to street level was completed in mid-2013. The rest of the building, however, has yet to be built until tenants for Tower 2 can be found. Richard Rogers Partnership designed Three World Trade Center, or 175 Greenwich Street, which stands across Greenwich Street from the Memorial's two reflecting pools. Groundbreaking occurred in fall 2008, and in May 2009, the Port Authority proposed reducing the tower to four stories. In 2012, with Silverstein still unable to find tenants, construction on the above-ground levels was delayed indefinitely, with plans for only 7 stories. However, work progressed on below-grade foundations and the ground-level podium, which was completed by October 2013. Anchor tenant Group M was finally signed in late 2013, but finance negotiations between Silverstein Properties and the Port Authority dragged, until an agreement was reached in June 2014. Construction resumed in August 2014, and the building opened on June 11, 2018. Maki and Associates designed Four World Trade Center, also known as 150 Greenwich Street. Construction started in 2008, and the steel skeleton was mostly complete by 2012. The building opened in November 2013, making it the second tower on the site to open behind 7 World Trade Center, as well as the first building on the Port Authority property. The first tenants to move in were two government agencies, and as of July 2015[update], the building is 62% leased. Five World Trade Center was designed by Kohn Pedersen Fox and will stand where the Deutsche Bank Building once stood. 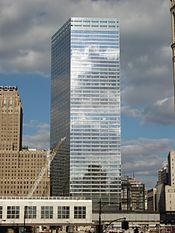 On June 22, 2007, the Port Authority announced that JP Morgan Chase will lease the 42-story building for its investment banking headquarters; however, JPMorgan's March 2008 acquisition of Bear Stearns had caused construction to stagnate, as the company changed its plans and relocated its headquarters to 383 Madison Avenue. Construction began on September 9, 2011. Although the foundation was completed, construction on the main structure never commenced. 7 World Trade Center stands off of Port Authority property. David Childs of Skidmore, Owings & Merrill designed the tower. Construction of the new 7 World Trade Center began in 2002 and the building opened on May 23, 2006, achieving LEED gold status and being the first tower in the complex to reopen. The building is 52 stories tall (plus one underground floor), making it the 28th-tallest in New York. A memorial called Reflecting Absence honors the victims of the September 11 attacks and the 1993 World Trade Center bombing. The memorial, designed by Peter Walker and Israeli-American architect Michael Arad, consists of a field of trees interrupted by the footprints of the twin towers. Pools of water fill the footprints, underneath which sits a memorial space whose walls bear the names of the victims. The slurry wall, which holds back the Hudson River in the west and was an integral part of Libeskind's proposal, remains exposed. Walker and Arad were selected from more than 5,000 entrants in the World Trade Center Site Memorial Competition in January 2004. On October 12, 2004, the LMDC announced that Gehry Partners LLP and Snøhetta, an architectural firm from Norway, would design the site's performing arts and museum complexes, respectively, in the same area as the memorial. The Snøhetta-designed museum will act as a memorial museum and visitors' center, after family members of 9/11 victims objected to the building's original occupant, the International Freedom Center. The Ground Zero Museum Workshop is a privately run 501(c) nonprofit museum that is not connected to the official Ground Zero Memorial or Gehry's museum. Construction of the memorial was completed by early 2011. The memorial opened on September 11, 2011, coinciding with the 10th anniversary of the attacks. The museum was initially scheduled to open on September 11, 2012, one year after the opening of the memorial. However, construction was halted in December 2011 due to financial disputes between the Port Authority of New York and New Jersey and the National September 11 Memorial and Museum Foundation, deciding on who should be responsible for infrastructure costs. Those disputes were resolved and construction resumed on September 10, 2012. Further delays were caused when Hurricane Sandy significantly damaged the site in November 2012. The museum was completed and opened to families of the victims on May 15, 2014 and opened to the general public on May 21, 2014. In early December 2013, Australian retail corporation Westfield announced that it will invest US$800 million for complete control of the retail space at the rebuilt center. Westfield purchased the Port Authority of New York and New Jersey's 50 percent stake in the retail part of the World Trade Center site, increasing its total investment to more than US$1.4 billion. Westfield World Trade Center opened with its first group of stores on August 16, 2016. It has roughly 365,000 square feet (33,900 m2) of retail space, which once again makes it the largest shopping mall in Manhattan. Although the new mall is only spread over roughly one-half of the original mall's footprint (due to the new space required for the below-grade National September 11 Memorial & Museum), the mall is double-level, whereas the original mall was a single level. Three additional levels will exist above-grade on the lower floors of 2 and 3 World Trade Center, while 4 World Trade Center currently houses four above-grade levels. The World Trade Center station's headhouse, the Oculus, also houses a large amount of retail space. Santiago Calatrava designed the World Trade Center Transportation Hub (its main asset being the PATH station) to replace the old World Trade Center station. The Transport Hub connects the PATH station to the WTC Cortlandt station (1 train), the Battery Park City Ferry Terminal, the Brookfield Place, and One World Trade Center on the west; and the 2, ​3​, 4, ​5​, A, ​C, ​E​, J​, N, ​R, ​W, and Z trains through the Fulton Center on the east. The new station, as well as the September 11 Memorial and Museum, is air-cooled via a heat exchanger fed by four pipes carrying water from the Hudson River. The cost for the transportation hub is estimated at $3.44 billion, a statistic that has seen much controversy given its greatly inflated cost. A temporary PATH station opened in 2003 and construction on the permanent station was supposed to begin in fall 2004; however, the NYPD raised security concerns on the entire site. Among the revisions effecting the Transportation Hub was doubling the number of support columns. 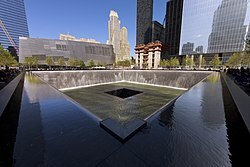 In the original plan, the construction of the 9/11 Memorial and Museum was only supposed to have begun after the Transportation Hub had been completed because the roof of the Transportation Hub provided the foundation on which the Memorial rested upon and the walls of the Museum. Due to the two-year delay and pressure by the victims' families to have the Memorial completed by the 10-year anniversary, it was decided to concentrate on building the Memorial and holding off construction of the Transportation Hub, which increased costs. Construction finally began on the Transportation Hub in 2010. The hub formally opened on March 3, 2016, several years behind schedule and billions of dollars over budget. The World Trade Center's Performing Arts Center was announced in 2004, with the building to be designed by Gehry Partners LLP and Snøhetta. Gehry's performing arts complex was proposed to house only the Joyce Theater, as the Signature Theater Company dropped out due to space constraints and cost limitations. Construction was to begin in December 2014 when the removal of the temporary PATH station commenced. However, the original plans were shelved in September 2014. After a design was chosen in 2015, it was announced that Joshua Prince-Ramus was awarded the contract to design the building. In June 2016, the center was renamed after billionaire businessman Ronald Perelman, who donated $75 million to the center, and on September 8, 2016, a design was revealed for the new center. The underground parking garage started construction in 2017 and the center proper will begin construction in 2018, The center is planned to open in 2020. When completed, the Performing Arts Center will include approximately 90,000 square feet across three floors. The public floor will be located at street level, and will house a restaurant/bar to provide refreshments during show intermissions. The second floor will consist of rehearsal and dressing rooms for theater actors, and the third floor will house three distinguished theaters. All three theaters are designed so that the walls will be able to rotate and expand to provide extra space for a single theater if needed. The theaters will occupy approximately 1,200 people combined. Liberty Park, a new elevated park, was built on top of a parking complex named the Vehicular Security Center at the southwest corner of the site. Construction began in 2013 when the Vehicular Security Center was completed. About $50 million was allocated to the park's construction by the Port Authority of New York and New Jersey in December 2013. The park opened on June 29, 2016. On August 16, 2017, the Port Authority installed the iconic sculpture The Sphere within the park, overlooking its original location in the old World Trade Center. Previously, the damaged sculpture by Fritz Koenig had been located in Battery Park. The underground complex and the checkpoint of the Vehicular Security Center has not yet opened as of 2014[update]. The St. Nicholas Greek Orthodox Church was originally supposed to be relocated, but the most recent plans call for the church to be built in Liberty Park. On July 23, 2008, the Port Authority of New York and New Jersey reached a deal with the leaders of the church for the Port Authority to acquire the 1,200-square-foot (110 m2) lot that the church occupied for $20 million, and relocate the church. Officials reneged in 2009, leading the Greek Orthodox Diocese of America to sue the Port Authority for failing to rebuild the church. On October 14, 2011, an agreement for the reconstruction of the church was signed that ended all legal action. The ground blessing ceremony and symbolic laying of the cornerstone took place in October 2014, with construction expected to be completed within two years. On November 29, 2016, the church structure was ceremoniously topped out with a temporary cross, which will be replaced with a permanent cross after the church dome is completed. The structure was slated to be complete by early 2017, but was later pushed to November 2018. The 1-acre (0.40 ha) park, measuring 300 feet (91 m) long and located at a height of 20 feet (6.1 m), has a capacity of 750 people. A green wall is located on the Liberty Street facade. A walkway from the pedestrian bridge curves along the park; egresses include three stairways, the pedestrian bridge, and a straight ramp down to Greenwich Street. Of these exits, a wide staircase is located parallel to Greenwich Street and directly behind the church. There are wood benches and a small amphitheater-like elevated space at the West Street end of the park. Finally, there is an observation balcony along much of Liberty Street and another slightly curved balcony at the church's foot. The original Fiterman Hall opened as an office building in 1959 and occupied a block bounded by Greenwich Street, Barclay Street, West Broadway, and Park Place. It was donated to BMCC in 1993 by Miles and Shirley Fiterman, for whom the building was subsequently named. In 2000, the State of New York Dormitory Authority, which owned the building, began a massive renovation to better adapt the building for classroom use. During the September 11 attacks in 2001, Fiterman Hall's structure was severely damaged by debris from the collapse of 7 World Trade Center. The renovation was never completed, and the building was condemned and demolished in 2008. After a series of delays, a new building designed by the architectural firm Pei Cobb Freed & Partners broke ground in December 2009 and was completed in 2012. "10048" redirects here. For the minor planet, see 10048 Grönbech. The World Trade Center site used the ZIP code 10048 before the September 11 attacks, and there were eight letter carriers assigned to the buildings to deliver mail to the buildings' tenants. All of the Postal Service employees survived the attacks. In the months following the September 11, 2001 attacks, over 80,000 pieces of mail continued to arrive each day addressed to the World Trade Center, including some items loosely addressed to such recipients as "The Search Dogs" or "The Rescuers". By 2003, 3,600 items of mail per day were still being sent to 10048. 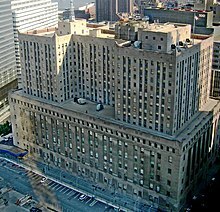 These items were processed at the James A. Farley General Post Office, the main facility for New York City, located across from Penn Station in Midtown Manhattan. Mail there was held for pick-up by messenger, forwarded to the intended recipient, returned to its sender, or destroyed. Following the attacks, the United States Postal Service provided free mail-forwarding service to the WTC's former occupants for three years, rather than the usual one-year period. By the end of 2006, the number of items sent to 10048 had decreased to around 300 items daily, mostly sent from businesses and organizations that had not yet updated their bulk mailing lists. The 90 Church Street Station Post Office building is located adjacent to the new World Trade Center and the PATH station, and serves the ZIP code of 10007, which is assigned to the surrounding Tribeca neighborhood. The new World Trade Center does not use the ZIP code 10048; rather, it has been integrated within the existing 10007 ZIP code. The 10048 ZIP code was used again after the September 11, 2001 attacks for a pictorial cancellation commemorating the anniversary of the attacks. ^ Dunlap, David W. (April 29, 2004). "In a Space This Sacred, Every Square Foot Counts". New York Times. Retrieved July 8, 2015. ^ Barry, Dan (September 24, 2001). "A Nation Challenged - The Site: 'At the Scene of Random Devastation, a Most Orderly Mission'". The New York Times. Retrieved July 31, 2010. ^ Greenspan, Elizabeth (August 28, 2013). "Daniel Libeskind's World Trade Center Change of Heart". the New Yorker. Retrieved July 8, 2015. ^ Hartocollis, Anemona (March 27, 2008). "Developer Sues to Win $12.3 Billion in 9/11 Attack". The New York Times. Retrieved July 31, 2010. ^ "US Shocked by Terror Attacks". BBC News. September 11, 2001. Retrieved December 31, 2009. ^ Barry, Dan (September 12, 2001). "A DAY OF TERROR: HOSPITALS; Pictures of Medical Readiness, Waiting and Hoping for Survivors to Fill Their Wards". The New York Times. Retrieved July 31, 2010. ^ Barry, Dan (September 17, 2001). "AFTER THE ATTACKS: THE TALLY; With No Miracle in the Rubble, Hope Grimly Shifts to Acceptance". The New York Times. Retrieved July 31, 2010. ^ Barry, Dan (September 24, 2001). "A NATION CHALLENGED: THE SITE; At the Scene of Random Devastation, a Most Orderly Mission". The New York Times. Retrieved July 31, 2010. ^ a b Hirschkorn, Phil (February 23, 2005). "Identification of 9/11 remains comes to end". CNN. ^ "NIST News Release: NIST WTC 7 Investigation Finds Building Fires Caused Collapse". NIST. August 21, 2008. Retrieved September 11, 2008. ^ Hirschkorn, Phil (December 30, 2001). "A NATION CHALLENGED: GROUND ZERO; First Viewing Platform Opens to the Public". The New York Times. Retrieved July 31, 2010. ^ Iovine, Julie V. (September 27, 2001). "Designers Look Beyond Debris". The New York Times. Archived from the original on January 30, 2013. Retrieved July 31, 2010. ^ "Winter Garden Restoration". New York Construction. ^ Dunlap, David W. (September 9, 2006). "Twin Beams to Light Sky Again. But After 2008?". The New York Times. Retrieved July 31, 2010. ^ Gaskell, Stephanie (August 25, 2008). "Pa. site of 9/11 crash gets WTC beam". New York Daily news. Retrieved August 26, 2008. ^ Varchaver, Nicholas (March 20, 2008). "The tombstone at Ground Zero". CNN. ^ "10 Years After 9/11, Deutsche Bank Tower Vanishes". The New York Times. January 12, 2011. Retrieved September 11, 2012. ^ Dunlap, David W. (April 22, 2004). "Who Owns Ground Zero? Don't Expect a Simple Answer". New York Times. Retrieved July 16, 2010. ^ "WTC Owner Turns Over Land for 2 Towers - - World Trade Center". Home || World Trade Center. Retrieved December 3, 2018. ^ Taylor, Tess (September 26, 2001). "Rebuilding in New York". Architecture Week. Archived from the original on May 11, 2011. Retrieved May 16, 2007. ^ "A Corporation to Rebuild Ground Zero". The New York Times. November 4, 2001. Retrieved July 31, 2010. ^ "Governor and Mayor Name Lower Manhattan Redevelopment Corporation" (Press release). www.RenewNYC.org. November 29, 2001. Retrieved June 16, 2008. ^ "Lower Manhattan Development Corporation Announces Principles for Development and Blueprint for Renewal for World Trade Center Site" (Press release). www.RenewNYC.org. April 9, 2002. Retrieved June 16, 2008. ^ Wyatt, Edward (January 11, 2002). "Everyone Weighs In With Rebuilding Ideas". The New York Times. Retrieved July 31, 2010. ^ Muschamp, Herbert (May 23, 2002). "An Appraisal; Marginal Role for Architecture at Ground Zero". The New York Times. Retrieved July 31, 2010. ^ "Port Authority and Lower Manhattan Developent (sic) Corporation Unveil Six Concepts Plans for World Trade Center Site, Adjacent Areas and Related Transportation" (Press release). www.RenewNYC.org. July 16, 2002. Retrieved June 16, 2008. ^ "Lower Manhattan Development Corporation and New York New Visions Announce Panel to Help Select Teams to Participate in Design Study of World Trade Center Site and Surrounding Areas" (Press release). www.RenewNYC.org. September 17, 2002. Retrieved June 16, 2008. ^ "Lower Manhattan Development Corporation Announces Design Study for World Trade Center Site and Surrounding Areas" (Press release). www.RenewNYC.org. August 14, 2002. Retrieved August 7, 2008. ^ "Lower Manhattan Development Corporation Announces Six Teams of Architects and Planners to Participate in Design Study of World Trade Center Site" (Press release). www.RenewNYC.org. September 26, 2002. Retrieved June 16, 2008. ^ McGeveran, Tom (February 9, 2003). "Beauty Contest: Two Firms Vie At W.T.C. Site". The New York Observer. Retrieved July 31, 2010. ^ a b Libeskind, Daniel (2004). Breaking Ground. New York: Riverhead Books. pp. 164, 166, 181, 183. ISBN 1-57322-292-5. ^ "Lower Manhattan Development Corporation". 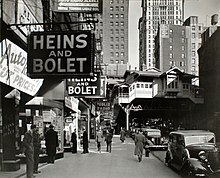 www.renewnyc.com. ^ "Silverstein's Army -- World Trade Center". www.wtc.com. ^ "Developer: Ground Zero a National Disgrace - 60 Minutes: Eight Years and Billions of Dollars Later, Part of 9/11 Site is Still Just a Big Hole". CBS News. February 18, 2010. p. 1. ^ Morabito, Greg (September 11, 2013). "Windows on the World, New York's Sky-High Restaurant". Eater NY. ^ "Cocktails Before the Collapse". esquire.com. September 10, 2016. ^ Louise Kramer (September 17, 2001). "Owner vows to reopen Windows On The World". Crain's New York. Retrieved July 23, 2017. ^ "WTC Scraps Windows on the World Plan". Gothamist. March 8, 2011. Archived from the original on March 13, 2013. ^ "Freedom Tower: About the Building". Silverstein Properties. Retrieved January 21, 2008. ^ Lerner, Kevin (August 2003). "Libeskind and Silverstein reach an agreement for WTC site". Architectural Record. ^ "Is the World Trade Center Safe?". Esquire Magazine. 2014. Archived from the original on September 26, 2013. Retrieved March 31, 2018. ^ Brown, Eliot. "One World Trade to Open Nov. 3, But Ceremony is TBD". Wall Street Journal. 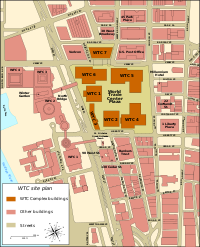 ^ Port Authority Approves WTC Construction Plan (August 26, 2010). Archived May 12, 2013, at the Wayback Machine NY1 local news channel. ^ "City Shells Out $32.9M To Lease Space At World Trade Center". NY1. February 25, 2011. Archived from the original on July 14, 2011. Retrieved February 26, 2011. ^ Smith, Greg (September 6, 2014). "Port Authority delays 1 World Trade Center opening as project takes more time, money than expected". New York Daily News. ^ a b "3 WORLD TRADE CENTER". wtc.com. ^ a b Geiger, Daniel (October 3, 2012). "GroupM Considers Huge Lease to Anchor 3 WTC". Commercial Observer. Retrieved November 3, 2013. ^ "Port Authority wants to dump three of five proposed skyscrapers for WTC site". NY Daily News. May 10, 2009. Retrieved April 24, 2014. ^ Agovino, Theresa (January 22, 2012). "Silverstein to call a halt at 3 WTC". Crain's New York Business. Archived from the original on April 4, 2017. Retrieved October 27, 2017. ^ Rich, Schapiro (September 10, 2013). "9/11 anniversary: After 12 years, new WTC taking shape after terror attack". New York Daily News. Retrieved November 14, 2013. ^ "Hudson Market project finds a home in Chelsea". New York Post. August 4, 2014. ^ "3 World Trade Center Opens Today: Here's a Look Inside". Commercial Observer. June 11, 2018. Retrieved June 11, 2018. ^ "Steel skeleton completed at 4 World Trade Center". Reuters. June 25, 2012. Retrieved October 27, 2017. ^ Plagianos, Irene (November 13, 2013). "4 WTC Becomes First Tower at Trade Center Site to Open". DNAinfo New York. Archived from the original on October 27, 2017. Retrieved October 27, 2017. ^ "NYC's World Trade Tower Opens 40% Empty in Revival". Bloomberg.com. November 12, 2013. Retrieved October 5, 2015. ^ Naanes, Marlene (June 22, 2007). "JP Morgan releases WTC tower plans". AM New York. Archived from the original on December 11, 2007. ^ Appelbaum, Alec (July 30, 2007). "Kohn Responds to WTC5 Criticisms". Architectural Record. Retrieved July 30, 2010. ^ Jones, David (March 20, 2008). "JPMorgan might flip WTC site". The Real Deal New York. Retrieved October 5, 2015. ^ a b Minchom, Clive (November 12, 2013). "New World Trade Center Coming To Life Already Impacts New York Skyline". Jewish Business News. Retrieved October 5, 2015. ^ Cuza, Bobby (July 8, 2011). "9/11 A Decade Later: The 9/11 Memorial From All Sides". NY1. Archived from the original on July 11, 2011. Retrieved July 10, 2011. ^ Collins, Glenn (2004). "Memorial to 9/11 Victims Is Selected". The New York Times. ISSN 0362-4331. Retrieved October 27, 2017. ^ "The Lower Manhattan Development Corporation Announces Selection of Architectural Firms to Design the Performing Arts Complex and the Museum Complex on the World Trade Center Site" (Press release). RenewNYC.org. October 12, 2004. Retrieved August 7, 2008. ^ Spitz, Rebecca (March 9, 2011). "9/11 A Decade Later: Glass Atrium Rises At WTC Memorial Site". NY1. Archived from the original on March 22, 2011. Retrieved March 15, 2011. ^ Erlanger, Steven (October 15, 2011). "Again in Norway, Events Provide Test for a King's Mettle". The New York Times. Retrieved October 16, 2011. ^ a b Pogrebin, Robin (March 28, 2007). "Ground Zero Arts Center Loses Theater Company". The New York Times. Retrieved July 31, 2010. ^ "History". Ground Zero Museum Workshop. 2013. Archived from the original on October 9, 2013. Retrieved December 15, 2013. ^ "WTC Memorial To Have Limited Access On 10th Anniversary". NY1. February 14, 2011. Archived from the original on May 13, 2011. Retrieved February 14, 2011. ^ "Port Authority: WTC Memorial Needs Another $3M For Construction". NY1. June 30, 2011. Archived from the original on September 21, 2011. Retrieved July 1, 2011. ^ Cuza, Bobby (September 5, 2011). "WTC Memorial Ready For Public Unveiling". NY1. Archived from the original on September 21, 2011. Retrieved September 8, 2011. ^ "Ground Zero Memorial and Rebuilding Fast Facts". CNN. August 30, 2017. Retrieved October 27, 2017. ^ Associated Press (September 10, 2012). "Some question 9/11 Memorial's $60M annual cost". CBS News. Retrieved October 27, 2017. ^ "Deal reached to resume construction on September 11 museum". Reuters. September 11, 2012. Retrieved October 27, 2017. ^ Bagli, Charles V. (September 10, 2012). "Ground Zero Museum to Resume Construction as Cuomo and Bloomberg End Dispute". The New York Times. ISSN 0362-4331. Retrieved October 27, 2017. ^ DUNLAP, DAVID W. (November 2, 2012). "Floodwater Pours Into 9/11 Museum, Hampering Further Work on the Site". The New York Times. ISSN 0362-4331. Retrieved October 27, 2017. ^ "National September 11 Memorial & Museum | World Trade Center Memorial". 911memorial.org. December 7, 2011. Retrieved December 11, 2011. ^ Iain McDonald and Nichola Saminather (December 5, 2013). "Westfield to Buy World Trade Center Retail Stake". Bloomberg Personal Finance. Bloomberg L.P. Retrieved December 15, 2013. ^ Hargrove, Channing. "World Trade Center Stores Finally Set an Opening Date", Racked.com, April 15, 2016. Accessed August 7, 2016. "Plan your summer vacations carefully. Tribeca Citizen is reporting that the first batch from approximately 125 stores coming to Westfield World Trade Center will open on August 16th; no names were named. Eataly will beat them all, though, with a July debut." ^ "Westfield World Trade Center Mall Opens For Business". newyork.cbslocal.com. August 16, 2016. Retrieved August 16, 2016. ^ "Retail || About the WTC || World Trade Center ||". Wtc.com. Retrieved December 16, 2012. ^ Dunlap, David W. (July 2, 2008). "Design of Ground Zero Transit Hub Is Trimmed". The New York Times. Retrieved July 31, 2010. ^ Dunlap, David W. (April 6, 2009). "Using the Hudson to Cool the Trade Center". The New York Times. Retrieved July 31, 2010. ^ Grynbaum, Michael M. (February 24, 2011). "Trade Center Transit Hub's Cost Now Over $3.4 Billion". The New York Times. Retrieved February 25, 2011. ^ "Port Authority Reports Increase In WTC Transit Hub Costs". NY1. February 24, 2011. Archived from the original on July 14, 2011. Retrieved February 26, 2011. ^ Cuza, Bobby (April 28, 2011). "9/11 A Decade Later: Port Authority Downplays WTC Transit Hub's Rising Costs". NY1. Archived from the original on April 30, 2011. Retrieved April 29, 2011. ^ "Mayor Bloomberg Discusses New Plan to Speed Rebuilding of World Trade Center, Including Memorial, in Weekly Radio Address". The official website of the City of New York. October 5, 2008. Retrieved October 27, 2017. ^ a b Dunlap, David W. (December 2, 2014). "How Cost of Train Station at World Trade Center Swelled to $4 Billion". The New York Times. ISSN 0362-4331. Retrieved October 27, 2017. ^ Brenzel, Kathryn (April 1, 2016). "The 'Path' to $4 billion". The Real Deal New York. Retrieved December 20, 2016. ^ Lorenzetti, Laura (March 3, 2016). "The World's Most Expensive Train Station Opens Today". Fortune. Retrieved December 20, 2016. ^ Verrill, Courtney (March 4, 2016). "New York City's $4 billion World Trade Center Transportation Hub is finally open to the public". Business Insider. Retrieved December 20, 2016. ^ Pogrebin, Robin (October 13, 2004). "Gehry Is Selected as Architectof Ground Zero Theater Center". The New York Times. ISSN 0362-4331. Retrieved October 27, 2017. ^ a b "Lower Manhattan Community Meeting #205" (PDF). New York City Department of Transportation. June 26, 2014. Archived from the original (pdf) on August 9, 2014. Retrieved January 7, 2016. ^ Pogrebin, Robin (September 3, 2014). "Arts Center at Ground Zero Shelves Gehry Design". The New York Times. ISSN 0362-4331. Retrieved October 27, 2017. ^ Jennifer Smith. "Architect Chosen for Performing Arts Center at World Trade Center". The Wall Street Journal. Retrieved November 20, 2015. ^ Cooper, Michael (June 30, 2016). "Ronald Perelman Donates $75 Million for Arts Complex at World Trade Center Site". The New York Times. Retrieved September 28, 2017. ^ Cooper, Michael (September 8, 2016). "Arts Center at Ground Zero Has a New Design, and Barbra Streisand in Charge". The New York Times. ISSN 0362-4331. Retrieved September 28, 2017. ^ a b Fedak, Nikolai (August 31, 2017). "Construction Begins Underneath The Ronald O. Perelman Performing Arts Center, World Trade Center - New York YIMBY". New York YIMBY. Retrieved October 13, 2017. ^ Pogrebin, Robin (July 23, 2015). "Ground Zero Arts Center to Shrink Further". The New York Times. Retrieved October 5, 2015. ^ Rosenberg, Zoe (September 8, 2016). "The World Trade Center Performing Arts Center is here, and it's beautiful". Curbed NY. Retrieved September 28, 2017. ^ Rosenfield, Karissa (November 26, 2013). "Elevated Park Planned for World Trade Center". ArchDaily. Retrieved April 24, 2014. ^ Budin, Jeremiah (December 13, 2013). "Liberty Park Funding Approved by Port Authority". Curbed NY. Retrieved May 15, 2014. ^ Gelman, Max (June 29, 2016). "New elevated park opens near the WTC 9/11 Memorial". NY Daily News. Retrieved July 1, 2016. ^ Walker, Ameena (June 29, 2016). "See photos of WTC's Liberty Park on its long-awaited opening day". Curbed NY. Retrieved July 1, 2016. ^ Plitt, Amy (August 17, 2017). "Iconic 'Sphere' sculpture, damaged on 9/11, moves to its permanent home". Curbed NY. Retrieved August 18, 2017. ^ a b Associated Press (July 23, 2008). "Church surrenders ground zero lot". MSNBC. ^ Dunlap, David W. (October 14, 2011). "Way Is Cleared to Rebuild Greek Orthodox Church Lost on 9/11". The New York Times. Retrieved November 2, 2016. ^ a b Bagli, Charles V. (March 18, 2009). "Church Destroyed at Ground Zero Is Still at Square One". The New York Times. ^ David Lee Miller, Kathleen Foster and Judson Berger (August 18, 2010). "Decision Not to Rebuild Church Destroyed on 9/11 Surprises Greek Orthodox Leaders". Fox News Channel. Retrieved August 26, 2010. ^ "Church Destroyed On 9/11 Files Suit Against Port Authority". NY1. February 14, 2011. Archived from the original on July 14, 2011. Retrieved February 14, 2011. ^ "Historic Church Destroyed On 9/11 To Rise Again". NY1. October 14, 2011. Archived from the original on May 12, 2013. Retrieved October 15, 2011. ^ "Ground Blessing for Saint Nicholas at WTC, a place of prayer and peace, a place of hope and love". New York: Greek Orthodox Archdiocese of America. October 19, 2014. Archived from the original on November 4, 2016. Retrieved November 2, 2016. ^ Papapostolou, Anastasios (November 29, 2016). "St. Nicholas Greek Orthodox Church Got Its Cross Back". Greek Reporter. Retrieved February 10, 2017. ^ Ralph Gardner Jr. (October 16, 2014). "A Church Near Ground Zero Reimagined". WSJ. ^ Weiss, Lois (September 6, 2017). "Agreement signed for Saint Nicholas National Shrine at WTC". New York Post. Retrieved October 27, 2017. ^ "First Look: Santiago Calatrava's Design for St. Nicholas Church". Tribeca Citizen. October 29, 2013. Retrieved April 24, 2014. ^ "BMCC's Fitermall Hall set to reopen, 11 years after its 9/11 demise". Newsday. August 26, 2012. Retrieved October 27, 2017. ^ "BMCC receives record cash gift". New York Daily News. Associated Press. April 30, 2007. Retrieved May 30, 2017. ^ Rubinstein, Dana (October 7, 2008). "Manhattan Community College Takes Space Near Terrorist-Damaged Fiterman Hall". Observer. Retrieved October 27, 2017. ^ a b c "Fiterman Hall". Borough of Manhattan Community College. City University of New York. Retrieved October 27, 2017. ^ "Work to Demolish Fiterman Hall may actually begin". Downtown Express. January 13, 2006. ^ "Mayor Bloomberg and CUNY Chancellor Goldstein Break Ground on New $259 Million Fiterman Hall in Lower Manhattan". The official website of the City of New York. December 1, 2009. Retrieved January 8, 2018. ^ "Post Office Holding Mail For World Trade Center". CNN. October 2, 2001. Retrieved March 19, 2007. Note: transcript says "seven letter carriers". ^ Pope, Nancy A. "Reestablishing Neighborhood Service". National Postal Museum. ^ Haberman, Clyde (November 14, 2003). "Twilight Zone For ZIP Code At Ground Zero". The New York Times. ^ Lagnado, Lucette (October 18, 2001). "WTC mail still goes through: The towers are gone, but the U.S. Postal Service has not abandoned its clients. Or the mail carriers who once served them". The Ottawa Citizen. ^ a b c Odell, Patricia (January 1, 2007). "...And the Mail Just Keeps Coming". Direct. ^ Barr, Meghan (December 4, 2006). "Mail Still Being Sent to Trade Center". Associated Press. ^ La Guerre, Liam La; Persichetti, Richard (September 18, 2012). "One World Trade Center Won't Get an Exclusive Zip Code: USPS Officials". Commercial Observer. Retrieved March 2, 2018. ^ "'We will never forget': Special cancellation commemorates Sept. 11." United States Postal Service.